This post contains affiliate links. That means if you click on an Amazon link and make a purchase, I get a kickback. It has been a whirlwind since school started this year. I am so glad to have a bit of a break to get caught up. 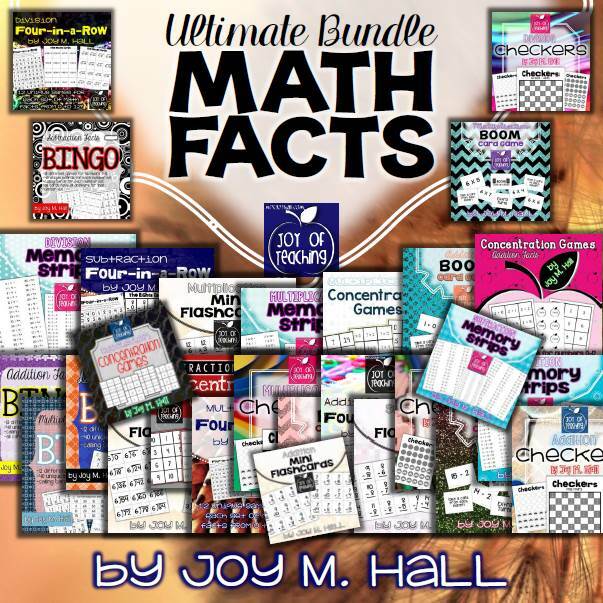 Before I get into the absolutely AMAZING research-based technique I have been using with my students who exhibit ADD/ADHD tendencies, I wanted to update everyone on my Ultimate Math Facts Bundle. Okay. Now back to dealing with kids who have attention issues. I have a handful of students who have significant attention and focus issues (who doesn’t?!). Most are medicated for it, but it still gets in the way of their learning and completing work. I’m talking about the fifth grader who will take an HOUR to write THREE SENTENCES. Or the fourth grader who flits from one spot to another, and takes several class periods to finish one short activity. I have a lot of techniques I’ve used in the past. Incorporating large motor activities into the day, using multisensory teaching methods, having them wear noise cancelling headphones, letting them sit on stability balls or stand when they work (or lay on the floor) are all things I’ve tried — mostly unsuccessfully. I will say that the more movement that is incorporated into their day, the better the results. But none of these things made a huge difference. Then one day, after having tried ALL of the above with the same student and being so frustrated I could’ve screamed, I started looking online for more suggestions. That’s when the magic began. I’ve now been doing this for several weeks and it is still working! Are you ready? Are you sure? Have you heard of binaural beats? I’m going to explain it the best I can. Basically, you play an audio and the student wears headphones to listen to it. The audio sends one frequency in one ear and a different frequency in the other ear (hence, why they need to use headphones). By sending two different frequencies, it changes brainwaves. Seriously. I’ve spent a good amount of time researching this. You can buy binaural beats CDs, but I’ve been using an app that let’s you choose what you want to work on (concentration, anxiety, and anger are just a few choices). It just sounds like white noise, but the Ambi Science app (it was $2.99 when I bought it) let’s you choose other background noise to layer over it (like campfires, storms, etc.). I’m pretty sure there is a free version, also. It has made such a huge difference that the students will come and ask for it. The kids are so proud of themselves for getting their work completed. They listen to it during centers, silent reading, tests, and independent work. It has been so exciting to see them physically calm down, almost immediately. Not only that, but there seems to be some residual effect after they have listened to it for a half hour or more. They are staying calm and focused even after they leave my room and aren’t listening to the binaural beats. Incredible! I’d absolutely LOVE to hear if you’ve tried this and what your results were. And if you haven’t tried it…well, what are you waiting for? Of course, while I was creating my new planner and all of my basic math fact products, I wasn’t doing much tidying up of my house. I would really LOVE a full time maid! REALLY! Let’s hope the beginning part of August slows down a bit! Leave me a comment about what you like about August! I am so crazy proud of my students! They have made an enormous amount of progress this year. After having a bad day yesterday, I needed to see these results. In Ohio, teachers have to write SLOs (Student Learning Objectives). We have to administer a pretest at the beginning of the year and a posttest at the very end of the year (or by the middle of April, apparently). For each one, we have to analyze the data and set target goals for each student. Last year I did horribly. It was the first year for SLOs and I had no idea what I was doing when I wrote my target goals. This year I was a bit more prepared, but still worried that my kids wouldn’t meet their goals. It is so difficult to write target goals for students with special needs when they will be tested with grade level assessments. My first SLO was for reading comprehension. Basically, the highest reading level where the student scored 80% or higher is what I was looking for. Check out the progress they made (I removed student names)! Only two kids didn’t make their target! 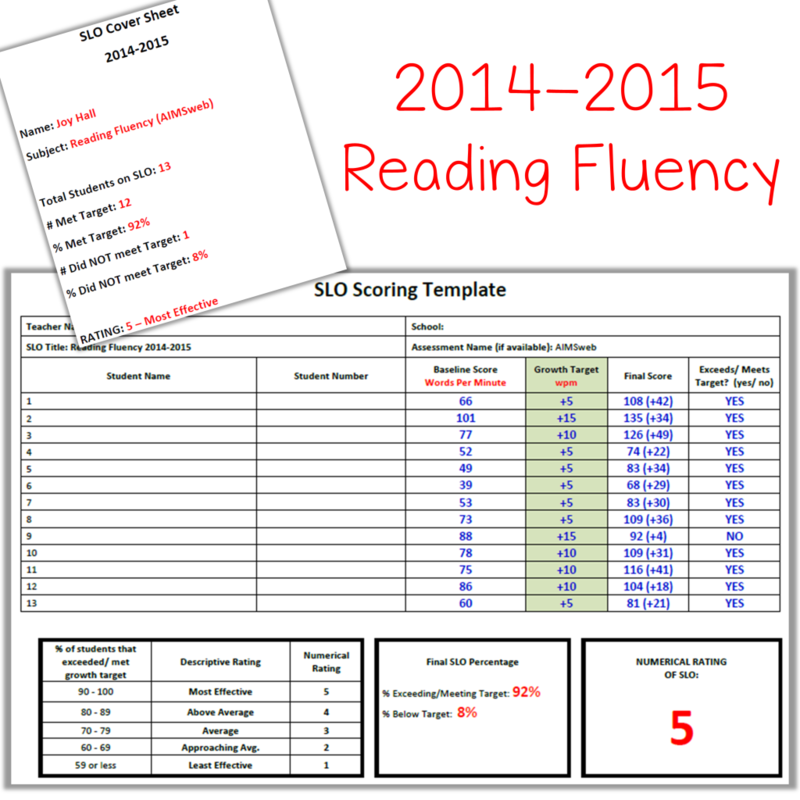 As impressive as the comprehension data is, it’s nothing compared to the reading fluency SLO. For this assessment, the students have to read a grade level passage and are timed for one minute. I didn’t set very high target goals for this because they are grade level passages with grade level words. They did an unbelievable job! My teacher’s heart is just bursting with happiness for them! 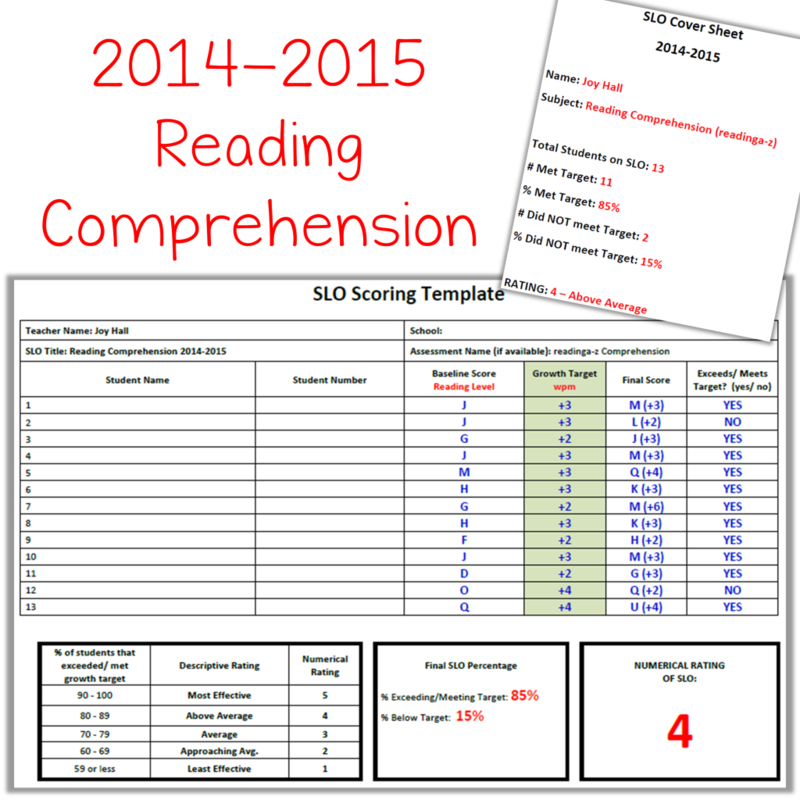 You can read more about how I structured my reading program this year by clicking here. What is your favorite thing about your reading program this year?